The Covington collection has expanded to include the addition of a 40-gallon receptacle featuring a classically patterned, laser-cut design manufactured from 10-gauge galvanneal steel. 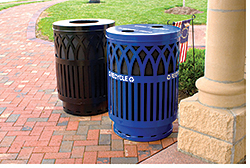 It is powder coated in recycle blue and topped with a flat lid that allows single-stream collection. The container is ideal for parks, schools, downtown streetscapes, shopping malls, and municipalities. A black, high-density polyethylene rigid plastic liner is included and is an encapsulated cable to keep the lid secure to unit.